Kids Inflatable Pools & Slides. 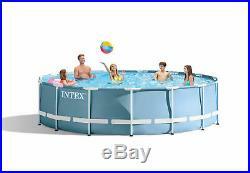 Intex 15' x 42 Prism Frame Swimming Pool Set w/ 1000 GPH Pump 26733EH. Intex 15' X 42 Prism Frame Above Ground Swimming Pool Set - Model 26733EH. At 15 feet wide and 42 inches in height and an filter pump system, the Intex 15' x 42 Prism&###xA0;Frame Set Pool is great for making a splash in the warm weather. Easy to assemble and maintain, this pool is great for hosting friends and family at an excellent value. Durable and easy to assemble, Prism Frame pools feature all of the great benefits of Metal Frame pools, and are enhanced with strong powder-coated steel tubing and a stylish and upscale looking liner color. Triple strong, SUPER-TOUGH&###x2122; laminated sidewalls are reinforced with an all-around band to keep frame legs firmly in place. This pool will make your backyard the place to be all summer as your family can relax and play. Includes everything you need for a great pool experience, including the Intex 1000 GPH filter pump (includes one Type "A" filter cartridge). &###xA0;Hydro Aeration Technology has been incorporated into the cartridge filter pump providing improved circulation and filtration, improved water clarity, and increased negative ions at the water surface. Proper installation of any above ground pool requires an area, sufficiently larger than the desired pool, to be leveled flat. Uneven ground, hills or holes must be leveled before pool assembly begins. If severely uneven ground prohibits level ground, proper installation will not be possible. Connect the Krystal Clear&###x2122; Cartridge Filter pump to enjoy clean, refreshing water. Includes pool ladder, ground cloth, and debris cover for convenience. Equipped with the Ground Fault Circuit Interrupter, which is an added safety feature that shuts off the pump if electrical current is exposed to water. Ready for water in 45 minutes, - follow the instructional DVD for easy set up, and enjoy the fun! Water capacity: (90%) 3861 gallons. Krystal Clear&###x2122; Cartridge Filter pump 1000 gph (110 &###x2013; 120V). &###xA0;Set-up and maintenance DVD. Convenient drain plug that connects to a garden hose so water can be drained away from pool or house area. 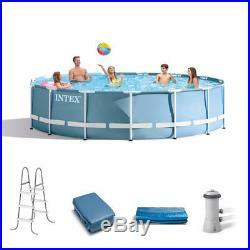 Intex 15 x 42 Prism Frame Pool Set - 26733EH. 90 Days on the Pool Liner and 1 Year on the Filter Pump. We deliver to 85% of the Continental US in 3 Days or less! We truly appreciate your business! Windy City SuperStore is here assist you. Please see individual item return policies for specific details. We will do our best to accommodate your request but we cannot guarantee the order will be cancelled. Tracking numbers are not "active" until the order is scanned into the carrier hub in the evening. This listing is currently undergoing maintenance, we apologise for any inconvenience caused. The item "Intex 15' x 42 Prism Frame Swimming Pool Set with 1000 GPH Pump 26733EH" is in sale since Sunday, November 19, 2017. This item is in the category "Home & Garden\Yard, Garden & Outdoor Living\Pools & Spas\Swimming Pools\Above-Ground Pools". The seller is "windycitysuperstore" and is located in Round Lake, Illinois.